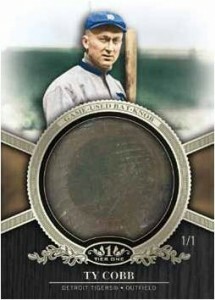 Topps has confirmed a massive checklist of bat knob cards slated for 2012 Topps Tier One Baseball. It's an impressive list too. Each 2012 Topps Tier One Bat Knob card has the end of a player's bat. They're not slivers, but rather the full circular knob. The checklist features 100 cards, all of which are one-of-ones. It's not like they're a bunch of scrubs either. Rather, the 2012 Topps Tier One Bat Knob checklist is filled with all-time greats, current superstars and recent All-Stars. 2012 Topps Tier One Baseball is scheduled for a late-June release. The all-hits release has no base set. 2002 UD Sweet Spot Bernie Williams Jumbo Game Used Bat Barrel #1 6 NY YANKEES!! RYAN SANDBERG 2011 TOPPS TIER ONE GAME USED BAT CHICAGO CUBS ! !